Wait! Did I miss something?? You may be wondering a few things. Such as, we already have a building committee? I didn’t know that we were even going to be building a new building. How did this happen? Take a look at the chart below. You can see that we have been in this process for over a year, in some ways. Last year as part of the strategic planning process the Infrastructure Team laid the groundwork for considering whether we have enough space in our current facility to accommodate the growth in attendance that we are already experiencing, as well as the needs for space occasioned by some of the strategic initiatives (for example, the ones having to do with adult education opportunities and becoming a center for ministry training). From that point, the elders began to discuss how to go about assessing what we need, and appointed a group (called the Space Needs Assessment Team, or SNAT) to research this. SNAT made their report to the elders in February, and the elders spent a considerable amount of time discussing the implications over the next few months. Since then, there have been some informational meetings as well as some groups appointed to take the next steps toward a decision which is expected later this summer. 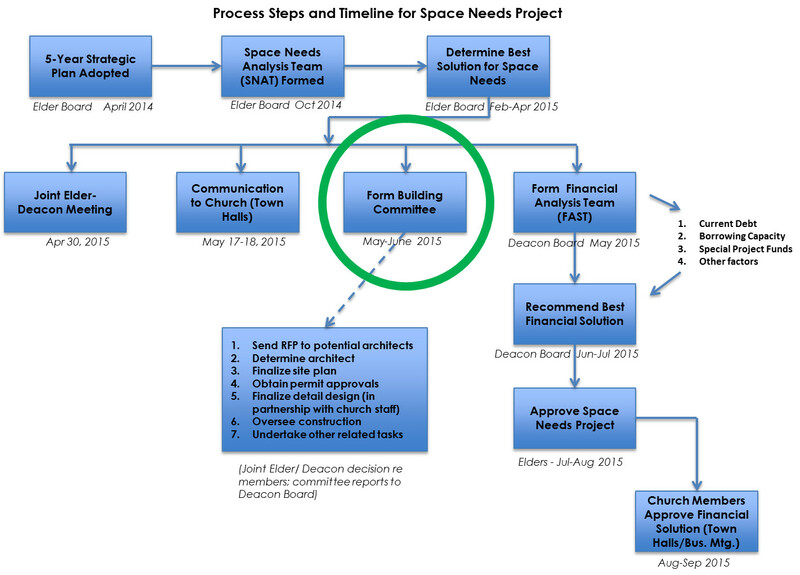 You can see on the flow chart that two groups have been formed, but that no final decision will happen until they have reported – in particular until the financial analysis has been done. And that brings us to the present moment, with a building committee getting underway. Please pray for us – our first meeting will be Saturday, May 30, from 9a-3p.